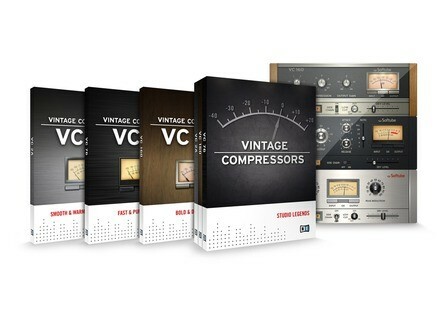 Vintage Compressors Bundle, Software compressor from Native Instruments in the Vintage Compressors series. Did you ask for the 1176...? Some hardware products —instruments, signal and effect processors— have a kind of Holy Grail status. Among studio processors —and regardless of their denomination: limiting amplifiers, leveling amplifiers or just compressors— the Teletronix LA-2A and Urei/Universal Audio 1176 LN, as well as the legendary Fairchild 660 & 670, which are extremely rare to find (we saw a unit sold for $42,000 on ebay...), are highly regarded pieces of gear you'll still find in big studios either as original or reissue versions. Many recording studios also use more or less faithful replicas of the originals designed by manufacturers ranging from Studio Electronics to Purple Action that (mostly) have a great sound quality. It's simple: these legendary tools can be heard on almost every album ever produced since they were first introduced. As expected, the software world also has its own interpretation of these legends. Since the early attempts by Bomb Factory to the latest products by IK Multimedia and Native Instruments in collaboration with Softube, and including the existing Universal Audio, URS and Waves products, the market is packed with software simulations. We do not intend to review all software versions (they are too many) nor to compare them with vintage or modern hardware products. We just want to compare two manufacturers and use the same plugins for Universal Audio's platform UAD-1/2 as a reference, without neglecting the performance of the original processors and some hardware replicas. 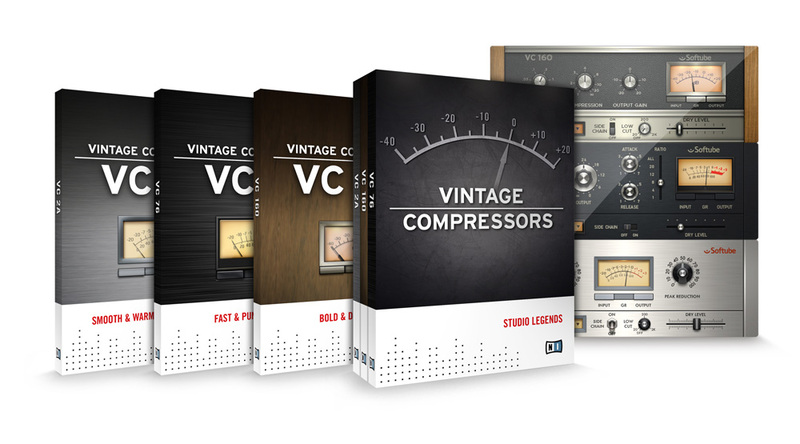 Note that Native Instruments' Vintage Compressors bundle also includes the famous dbx 160 compressor, which we won't take into account for this review. Native Instruments decided to collaborate with Softube, a manufacturer that has launched quite exceptional plugins — I can't seem to get enough of — like the Acoustic Feedback and the Tubetech CL 1B. I haven't had the opportunity to try out their reverbs and amp simulations yet, but other user's feedback is very promising. So let's start with the Urei 1176 LN and Teletronix LA-2A emulations (VC 76 & VC 2A) conceived for Guitar Rig 4, like the other Studio Effects of the manufacturer. The good news is that the Guitar Rig 4 player is free. The bad news is that you can't use the plugins unless you have the manufacturer's guitar multi-effect. Available for Mac (Intel only) and PC in 32-bit and 64-bit versions, the bundle —including the host (GR4 or GR4 Player) plus the plugins— supports AU, VST and RTAS formats and includes a standalone version. As always, activation is done via the Service Center. As their name already implies, IK Multimedia's T-RackS Black 76 and T-RackS White 2A were conceived to work within T-Racks 3, but also as individual 32-bit or 64-bit plugins to be used directly in any DAW that supports AU, VST or RTAS. As usual, to activate them you'll have to use the Authorization Manager. As for Universal Audio's UAD 1176LN and UAD LA2A plugins, they are only available for the DSP cards developed by the manufacturer, from the UAD-1 to the UAD-2 Quad. Our card uses OS 5.9.1. The plugins are Mac and PC compatible, they support 32-bit and 64-bit operation (only the card drivers actually work in 64 bits, the plugins still operate at 32 bits and require a bridge), and work with AU, VST and RTAS. 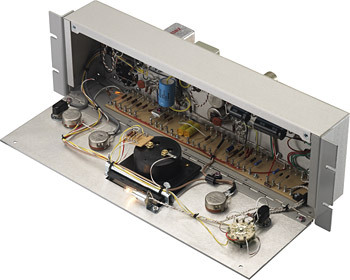 All software manufacturers took their inspiration from the LN version of the FET 1176 compressor. LN (for Low Noise) means that the product includes a modification made by Mr Plunkett, engineer at Urei, who wanted to reduce the noise. You can recognize it by the famous black front instead of the traditional burst aluminum front with blue stripes around the VU-meter. These versions, referred to as C, D and E, are the most venerated. From a technical and audio standpoint, FET compressors contributed the principle of adjustable ratio, as well as much shorter attack and release times compared to competitors using Vari-Mu or optical designs. IK Multimedia designed its plugin based on an E model. Neither Native Instruments nor Softube give any information on this matter. However, Softube's experience developing the FET Compressor was certainly an advantage for Native Instruments. UA doesn't give any information about the model either. Anyway, all three have a very similar sound character, just like signal processors that use only analog components (don't forget that every unit sounds slightly different than the other, even if it's the exact same version). As for the features, except for the major innovation in the form of a stereo version (we're talking about the 1176, not the Urei 1178 stereo version), UA stays faithful to the original. Thus, you get all the original features users like so much for their ease of use: a pair of big controls for input and output adjustment, two smaller Attack and Release knobs, four Ratio buttons (4:1, 8:1, 12:1, and 20:1) including an All-Buttons mode, and four VU-meter buttons (Off, +4, +8, and GR). However, you don't have the possibility to set the Attack control to Off, which would switch the compressor to ratio 1:1, meaning you could process the signal without compression in order to get only the device's sound character. All three manufacturers reproduced the (confusing, at least in the beginning) operation of the controls: the fastest attack time is not hard left (1) but hard right (7). The same applies to the release. Attack times range from 20 to 800 microseconds (yes, micro! ), while release times range from 50 to 1,100 milliseconds. Native Instruments and IK Multimedia added some modifications. IK Multimedia added four snapshots, taken from T-RackS's architecture, plus L/R and M/S buttons allowing the user to choose between one of the two operating modes (well done!). Three additional buttons (L, R and =, where L and R become M and S in M/S mode) allow the user to process the two channels of a signal separately or together. IK Multimedia's version also displays the setting values, but they don't quite match reality, at least for Attack and Release, which is a pity. What's the use of adding values if they have no meaning... The All-Buttons mode is accessible via a dedicated knob. Ratio 1:1 is available clicking the Off button under the Attack control. You also have Bypass and Reset buttons. In Native Instruments' version, a Ratio slider replaces all four original buttons but offers all usual values (4:1 to 20:1 plus All-Buttons mode). The 1:1 ratio replaces the bypass button under the Attack control. The VU-meter management also changed: you can display the input level, output level and gain reduction. The plugin comes with a preset menu accessible via the advanced settings. The side-chain input (great for techno/electro fans) comes with a slider that allows the user to adjust the amount of direct signal so that parallel compression is possible by adjusting the output level (which has no effect on compression itself). Unlike Softube's FET Compressor, note that you get no continuous Ratio setting. We set the same values on all plugins and then fine tuned them when it was necessary due to the too obvious differences in performance, as you can see in the screenshots. The goal was to get the same output level with all plugins and, more importantly, the same values displayed on the plugins VU-meters to check out how the manufacturers calibrated their controls and VU-meters. It was sometimes necessary to use Logic's Controls view to adjust the parameters more accurately than with the GUI of the plugins. We also used a DPeak Meter Pro at the end of the signal path to do a last level check. Let's start by processing a drum loop with a fast attack time (@ 7, which means 0.00002 sec. with the 1176...), a pretty fast release time (@ 6), a compression ratio of 8:1 and an input setting leading to a maximum gain reduction of 5 dB on the VU-meter. You'll hear first the unprocessed loop, then the loop with the UA, then IK Multimedia and then Native Instruments. Finally, you'll hear a special guest: the TC Electronic 24/7... I had it at hand. You'll here differences between all processors in the low frequency range, however it's the hi-hat that changes the most due to subtle coloration. The result is a fuller sound, which is rather obvious with almost every plugin, a bit less with the NI and the TC. Let's change now the ratio to 12:1 and set the (displayed) gain reduction to 10 dB. Things begin to get clearer. The UA shows a very strong character, the IK delivers an even more punchy and hyper-realistic version, while the NI is more subtle (different transient management leading to a lower output level). Even if it's nothing to be ashamed of, we must say that the TC has not a very strong personality. On all compressors, the VU-meter reaches +3 dB in the red zone, except on the 24/7, which doesn't sound like the others at all with these settings (it limits the signal very strongly...). The performance of the UA 1176LN is also very different from the others. 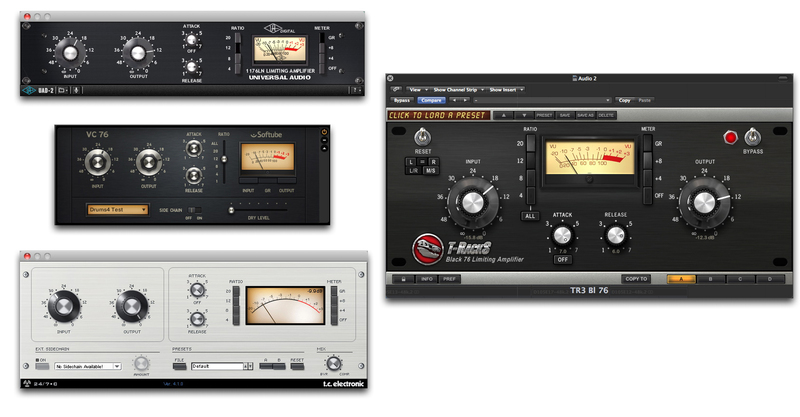 If we were to rely on the VU-meter alone, the resulting sound would make us believe we used high compression settings. With settings similar to the two other plugins, the sound is totally different. You'll notice also that transients pass through the IK and NI compressors, which doesn't allow you to increase the output level. It's a pity because if you limit the attacks the result is pretty close to the UA, our reference. In order to put all candidates on equal terms (in theory), here is an example including the UA, IK and NI with input level at max., unchanged attack and release and output level adjusted so that it never exceeds 0 dB. The 1176 is also widely used for vocals. We chose a recording with pronounced amplitude variations and a max. level of 0 dB. You'll notice slight timbre variations because the singer was moving in front of the mic. Let's listen to what the plugins can do. We used the following settings: Attack @ 3 so that the compressor follows all dynamic variations, Release @ 5, Ratio @ 4:1 and input set to read 5 dB of gain reduction on the VU-meter. All three plugins have a very similar performance with a nice effect on vocals. Let us now use the same Attack and Release settings, but with Ratio set to 8:1 and the output setting adjusted to get 10 dB of gain reduction. It's a lot of compression for only one vocal track but the original recording has a high dynamic range and this allows us to hear the behavior of the plugins with rather extreme settings. The dynamic response is impressively smooth and the signal stays very musical (if such dynamic loss can still be considered musical...). Finally, an electric guitar sample: the compressors allow you to "dirty" them a bit by emphasizing muted notes and chords. The settings: average Attack time (@ 5.5), short Release time (@ 6), Ratio @ 8:1, gain reduction around 7 dB with a couple of peaks reaching 9 dB). As you can hear, all compressors have a similar typical sound character. Ratio and Attack/Release times change according to the input signal, which is what everybody expects. The same applies to transient processing. However, what makes the plugins different is their individual frequency responses and the saturation they add (the All-Buttons mode gives very different results). We liked the large VU-meter on IK's plugin, which reacts rather slowly, just like NI's. The fastest VU-meter (although not always easily readable) is Universal Audio's. The optical tube compressor Teletronix LA-2A by James F. Lawrence Jr. (who started to think about the problem of compression in the 1920's...) is the other compression legend that inspired the manufacturers. UA offers you an exact replica while the other brands added some more features. It's difficult to find simpler controls: a switch allows you to choose between limiter and compressor (which means the unit modeled is version 2, called "Silverface"), a Gain control adjusts the output level of the compressed signal (no input level setting), and a Peak Reduction control determines the compression ratio. The Peak Reduction control adjusts both the compression ratio and the level threshold (signals above this value are compressed). 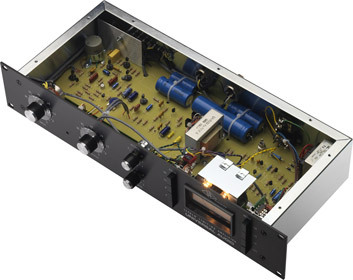 This is one of the distinguishing marks of the LA-2A (and of all compressors based on the same design). The VU-meter displays either the gain reduction or the output level (+4 or +10). Basically, the attack time can be as short as 10 milliseconds, while the average release time is 40-80 milliseconds and can take 0.5-5 seconds to go back to the original level. All parameters react to the input signal: the attack time to the frequencies and the release time (the key parameter of the LA-2A) to the sustain of the input signal at a given level or to heavy compression (on the original hardware this affects the behavior of the LDR). IK added reset, bypass and other buttons to switch between L/R and M/S mode. Native Instruments extended the VU-meter features adding input level, gain reduction and output level. You also get a side chain with the direct signal level slider, and a low-cut filter (20 Hz to 2 kHz) to shape the spectral content of the input signal. An excellent idea considering the smooth reaction of the compressor. This way you can avoid the compressor being triggered by low-frequency energy at the expense of the high-frequency range. Let's use the previous vocal recording again, since the LA-2A is widely used for such applications (some engineers even use a 1176LN + LA-2A chain) due to its soft knee characteristic, an almost fixed ratio of 4:1 and its special envelope, which gives wonderful results. The plugins are adjusted so that they display a 5 dB gain reduction. The listening order is still the same: uncompressed signal, UA, IK, and NI. Both UA and NI models have a very similar performance but the IK emulation manages high levels in a different way. What surprised us most is the remarkable setting differences needed to achieve a similar result. Let's try with a 10 dB gain reduction. We also gave it a try with an acoustic guitar in order to smooth the musical phrases a bit applying maximum 6 dB of gain reduction. The smoothness and the musicality are well reproduced and very different from the 1176, even if all plugins give different results, and in spite of the obvious disparities in the settings. Once again, the UA and NI are very similar. Finally, a double-bass with about 5 dB gain reduction. The attenuation of transients with the UA is a bit more evident. The average volume of IK's plugin is a bit lower than the others, even if the compression itself has a very similar behavior. However, all three candidates boost and extend resonances pretty smoothly. On the other hand, the screenshot shows that we needed incredibly different settings to get the same results. You'll clearly hear the compressor working on the sustained notes thanks to the special behavior of the release. Moreover, transients are preserved thanks to the slow attack typical of optical designs. UA's plugin emphasizes high frequencies a bit while NI's boosts the lower end a bit. IK's compressor produces a slightly lower average level because of its particular transients management. And these tools are affordable, which is not the case of the hardware gear they are based on. Each IK Multimedia module is sold for €89.99 and can be used in T-Racks. The Native Instruments bundle (including the three compressors) is sold for €199, while single plugins go for €99; and Guitar Rig Player 4, which is required for their use, is free. Moreover, both manufacturers offer fully-usable demo versions, which is an excellent way for you to expand on this comparison.